Peter Burr’s Pattern Language is an “immersive multi-channel video environment” composed of 5 main phases that are repeated in two variations. This piece utilizes footage from Burr’s game in development, Aria End, which depicts a mutating death labyrinth projected inside a 4-channel video cube. Dissecting the phases of the piece, the audience will experience the part titled STROBE, named due to its strobing flashes of black and white. Another phase displays the algorithm used in John Conway’s Game of Life to display a pixelated, star-like pattern on the screen. The entirety of the piece is tied together by the black and white color scheme along with the pixelated design and pattern-like movement. The other phases incorporate the pixelated formation of human figures walking through hallways, or interacting with a touchscreen. The patterned rhythm of the piece is further represented by the phases made up of pulsating lines, squares, and other interconnected structural patterns. The music of the piece “alternates between a sort of rhythmic minimalism and a heavy digital drone” to further tie the piece to early computer art, while also maintaining a modernized spin. This is essential in evaluating Burr’s piece because the evolving scenes and ever-present movement create a sense of aliveness through Burr’s carefully designed patterns. The digital architecture is a key component in the formation of the utopian world comprised of complex labyrinths and high-tech digital design. Burr’s piece not only applies architectural design to a digital space, but it then seeks to question how a digital population will reside in this utopian society. 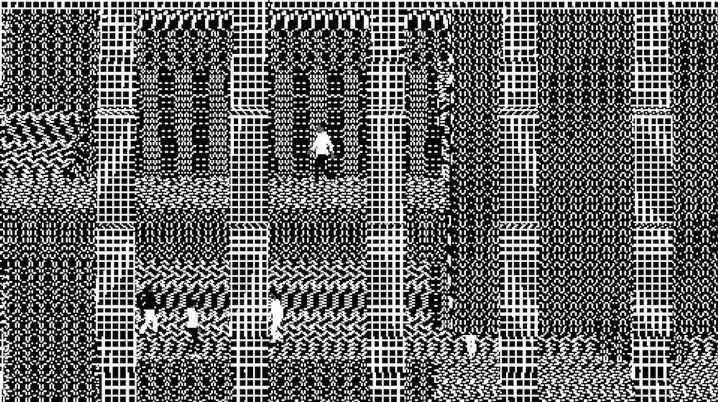 The abstract, pixelated perspective of individuals walking through a building gives the audience a sense of surveillance, as the audience becomes onlookers of this virtual world. While watching this virtual population interact with their virtual world, one might encounter a moment of unique self-reflection evaluating the increasingly digital reality of the 21st century. The phases shift from looking at pixelated human forms to just looking at the patterns these forms encounter, which transforms the audience in and out of Burr’s creation. In comparison to Peter Burr’s game, Aria End, in which utilizes the same scenes, the level of interaction from the audience is the key differentiator. As Pattern Language transports the audience into the experience by providing a constantly changing perspective, the game furthers this sensation by actually allowing the audience to act rather than just visualize. Pattern Language is key when assessing Aria End because it provides insight into Burr’s creative process. Before creating the interactive element, Burr allowed his art to control the viewer's journey through the complex and dynamic labyrinths. This element of control is largely altered when the audience becomes the primary navigator of the experience. Within the construction process of game Aria End, pieces like Pattern Language act as a minimum viable product to test the audience's reaction to the artistry before committing the immense amount of time and funds to game development. 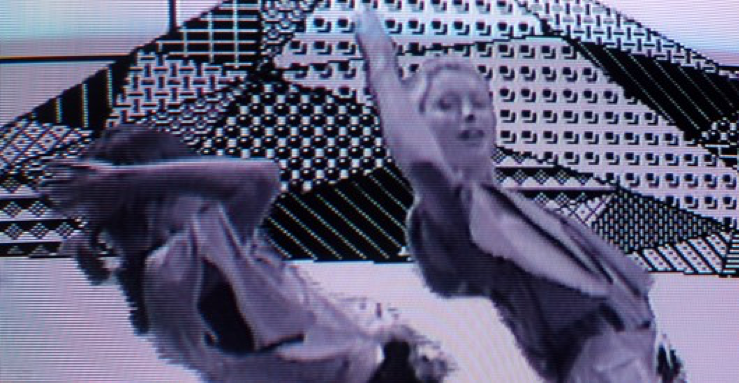 When evaluating the artistic styling of the piece, Cory Arcangel’s Infinite Fill work produces the same black and white video effect, embodying the aesthetic of early computer art. Before computers could display color, they would create patterns to fill the blank spaces where color would exist, which gave new depth to the piece. The black and white patterns create the appearance of a dynamic environment that was hard to capture in a digital environment. Pattern Language utilizes black and white patterns to demonstrate the movement and depth of the piece, also feeding off of the aesthetics of early computer art. This usage of patterns is an abstraction from reality and a direct tribute to the history of digital art. This return to the 1980's aesthetics of early functioning computers allows both pieces to be transformed into a historical commentary, while also creating an abstract spin on the digital art that occurs with modern technology. Pattern Language’s usage of strobing screens, effective patterns, and changing point of perspective create an anxious experience as the viewer must engage with the labyrinths and digital architecture, while also separating themselves from the digital population that consumes these spaces. The piece accomplishes a seemingly simple visual experience, yet the complexity of the creation process transforms this piece from early computer op to a stylistic tribute to the foundation of digital expression.